Martha’s Vineyard vacations contain a goldmine of picturesque villages, stunning beaches and delight-to-the-eye wildlife reserves. The Vineyard is famous for spectacular views, relaxing times, and an unique island experience. Once an active whaling port when the ships migrated from Nantucket, now the migration is of a different kind. It’s mostly people from the mainland seeking memorable Martha’s Vineyard vacations. The major towns to visit on your Martha’s Vineyard vacations are Vineyard Haven, Oak Bluffs, and Edgartown. All these towns are on the northeast side of the island. At 20-miles long, and 10-miles wide it’s the largest island in New England, yet it’s small enough to tour and explore in a week. Day-trippers or a weekend jaunt are a little more harried. Yes.. you can take the short ferry ride from Woods Hole to Vineyard Haven. And then you can rent a bike or a moped, and race around the island on a whirlwind tour seeing all the high points and towns. Yes… you can rush around breathless doing all this touring… searching out restaurants… and even take a dip in the ocean. … but that’s not really what Martha’s Vineyard vacations are all about. Plan to spend a few days or better still a week if you can, exploring the delights of this most picturesque of islands. 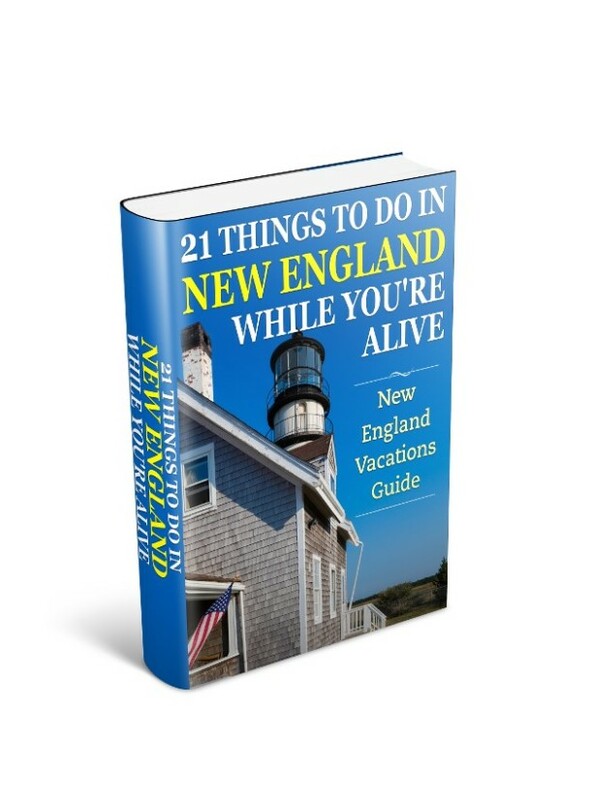 Getting around on Martha’s Vineyard vacations…. I’ll give you information on getting to the island later, but for now let’s focus on your options of getting around on your Martha’s Vineyard vacation. The absolute best way of seeing the island is bicycle. If pushing a pedal is against your religion… or body… then touring the island by moped or scooter is another option – but not always popular with the locals. You can also take your car over on the ferry but you’d better book well in advance during the summer season. Cars can be rented at either of the ferry ports of Vineyard Haven or Oak Bluffs – but again, reservations are a must. The island has a great bus service if you’ll be staying close to the northeast larger towns. Many visitors on Martha’s Vineyard vacations take their own bike over on the ferry with them. But don’t worry if you arrive without one, as it seems to me every other shop in Vineyard Haven, or Oak Bluffs is a bike and moped rental place. The three larger towns of Vineyard Haven, Oak Bluffs, and Edgartown are all on the northeast side of the island. And despite the closeness there’s a different feel and attraction to each. Vineyard Haven is perhaps the hard working and living town on the Vineyard – the commerce center. It’s very active all-year round, and has the sort of shops and attractions you’d expect catering to year-round residents. 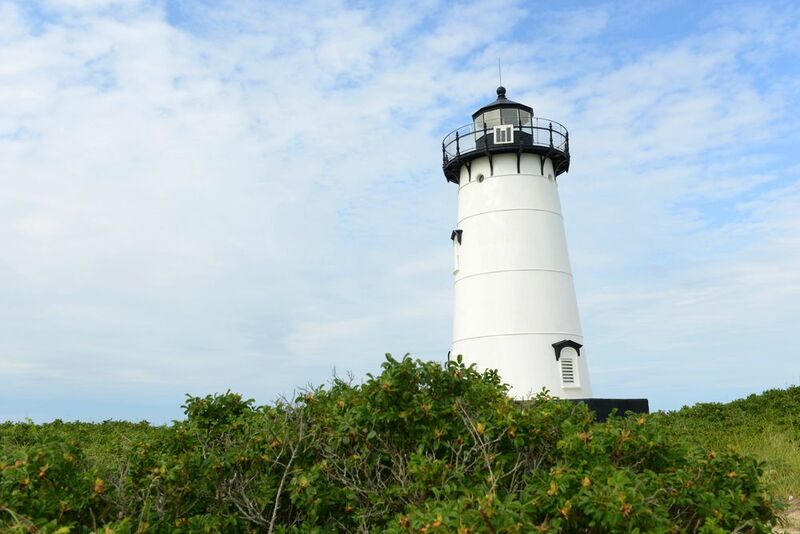 Take a short ride out from the center to get a close-up view of the Vineyard’s first lighthouse – West Chop Lighthouse. A short ride over to Oak Bluffs presents a different side of the island. Oak Bluffs has more of a seaside town flavor to it. Here you’ll find both charming gingerbread houses and one of the oldest operating carousels in the United States – great for the kids and the child in you. Edgartown is more elegant with many fine houses built by whaling captains during a time of their financial abundance. In addition to walking around town and admiring these houses, you’ll also find museums and reminders of how important the whaling industry was to the fortune of the town. Edgartown also has an unusual ferry ride across to Chappaquiddick Island. It’s a short 100-yeard dash across on a ferry with no schedule. It just leaves… when it’s full. They call it the “on-time” ferry because it’s, well… never late! You’ve probably fathomed out already I’ve a sweet spot for cycling during my Martha’s Vineyards vacations. And so it’s no surprise I’ve included a special section here. A bike’s also a neat way to visit the wildlife refuge and parks dotted around the island. 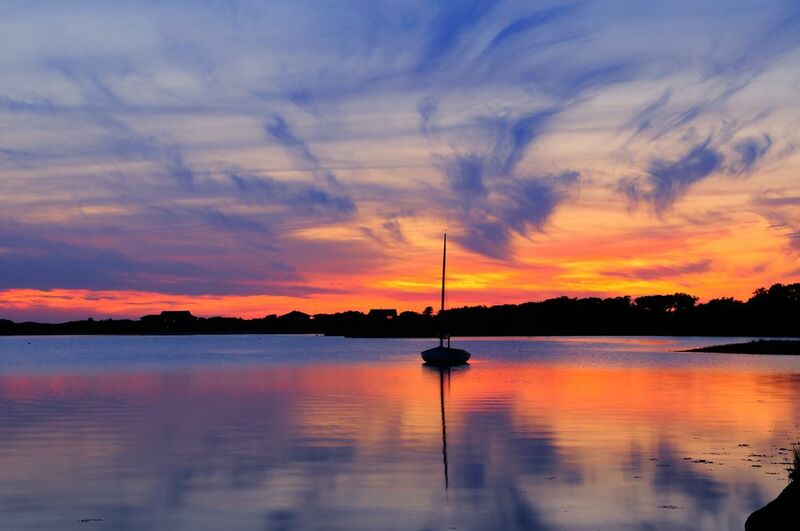 The most popular trails – because they’re almost level – connect Vineyard Haven to Oak Bluffs to Edgartown, and then onto Katama (South) Beach. This is a very popular bicycle path route, particularly in the summer, so getting around fast isn’t part of the deal here. The state forest in the center of the island is also laced with great bicycle paths along with horseback riding and hiking trails. For something different and requiring more time and planning, hop on the short ferry ride at Edgartown across to Chappaquiddick Island. Here are bike trails that’ll take you out to wonderful beaches and the Cape Pogue Wildlife Refuge and Wasque Reservation. You’ll find these areas less crowded than others on your Vineyard vacation. The area abounds with salt marshes and tidal flats, which makes it a bird-watchers paradise. 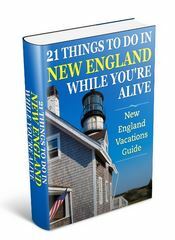 When visiting these areas, and many others on your Martha’s Vineyard vacations, make sure you take along your binoculars and camera. Not all the best bike rides and wildlife sanctuaries are reserved for the northeast pocket of the Vineyard. Out west, which the local’s call “Up Island”, are less traveled but still beautiful areas to visit on your bike. Now the west area of the islands is more challenging on a bike than the east side. It’s hilly and undulating and mostly above sea level. But then again most things worth seeing demand a little extra effort. And getting there is… well worth the effort. Just be aware you’ll be biking on roads and not paths, but the traffic is light in these areas. While not a bike trail the Cedar Tree Neck Wildlife Sanctuary is one of the gems out in the West Tisbury area. You’ll have to leave your bike secured at the parking lot near Indian Hill Road. Hike the trail to the summit of the sanctuary and marvel at the breathtaking views of the ocean and cliffs of Aquinnah. The roads around Chilmark and Menemsha fishing village, and out to Aquinnah make for captivating scenic rides. Allow plenty of time to do these rides if you’ve a ferry to catch. There are numerous beaches to enjoy on Martha’s Vineyard vacations, despite the drawback that many of the Island beaches are private. The public beaches are plentiful and I’ve listed just a few here to get you started. I’ve also marked them on the map for your easy reference. Katama Beach, also called South Beach, is a 3-mile long stretch of barrier sand. Easily reached from Edgartown, it’s the end point for the bike path running south from Edgartown. Lighthouse Beach is a short walk out to a quiet area of Edgartown near the… surprise… Edgartown Lighthouse. The other side of the island offers two beaches worth a trip at Menemsha and Aquinnah. Menemsha Beach can be reached from the harbor in the town. It’s a great place to watch the boats going in and out of the harbor and just relaxing. The area was supposed to be the inspiration for scenes from the movie “Jaws.” But you won’t find any sharks in the area. Aquinnah Beach is reached by navigating a 10-minute hike through cranberry bogs and scrub. The 5-mile beach is an irresistible walk with breathtaking views of the famous clay cliffs, and the lighthouse that sits atop. In 1998 the town of Gay Head changed its name back to Aquinnah, after the Aquinnah Wampanoag tribe. The area is home to members of the tribe, and a number of rich and famous people who you can’t meet, and don’t want to particularly meet you – no offense meant. But perhaps the main purpose is to walk around and admire the area for the unique and famous multi-colored layer Gay Head Cliffs, the picture-postcard lighthouse, and long beach walks. Here you’ll feel a soothing remoteness and true island feel. After all is said, that’s the main reason you chose Martha’s Vineyard vacations in the first place, right? Getting to Martha’s Vineyard is pretty straightforward. Ferry service is available from Woods Hole and Hyannis. Service from Hyannis is limited to the summer season. The Steamship Authority ferry arrives at Vineyard Haven and Oak Bluffs from Woods Hole. You’ll also be able to rent a bike or moped here for your Martha’s Vineyard vacations. The Steamship Authority is the only service that transports cars, and during the summer, reservations are an absolute must. Hy-Line Cruises runs a passenger ferry service only from Hyannis to Oak Bluffs during the season. To be honest it’s hard to get lost on the roads during your Martha’s Vineyard vacation. Okay, maybe you’ll wander off and have to ask directions occasionally. But everybody is friendly and low-key, and so relax and have fun. Accommodation on Martha’s Vineyard is varied. You’ll find inns and bed-and-breakfasts littered throughout the island, but with the largest selection in the northeast area. But remember this is not Boston or even Cape Cod. With a limited supply, places fill-up fast, and so reservations are a must. To discover where to stay deals, and compare rates and amenities with a trusted and professional travel organization then check out Martha’s Vineyard lodging and accommodations.